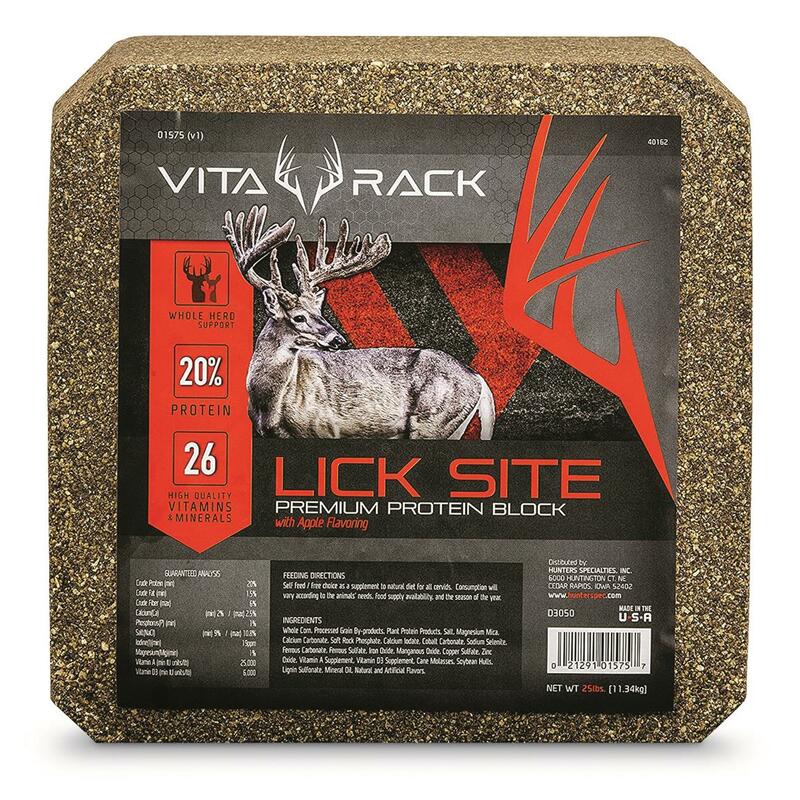 Vita Rack Lick Site Protein Booster Block, 25 lbs. Bulk up Bucks with this protein block. How many licks does it take to get to the center? Deer can't help but find out. Feed this Protein Booster Block to deer as a supplement to their diet. 20% protein - corn, soybeans, molasses... and just a little hint of apple keep them coming back for more! Bulks up weight and increases antler development. Weighs 25 lbs. Get this protein block now! 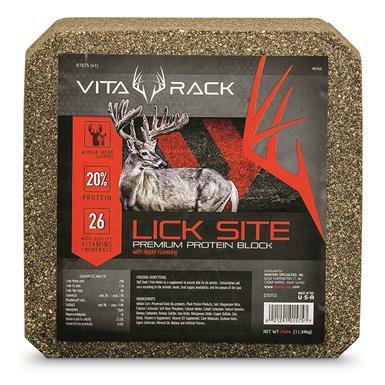 Vita Rack Lick Site Protein Booster Block, 25 lbs. is rated 4.7 out of 5 by 43. Rated 4 out of 5 by Bighorn from Powerful Put this block out on a Wednesday in early February and 8 days later it is almost gone. I cannot believe how quick the deer have devoured this block. Rated 5 out of 5 by perchhunter from Deer love it. In less than a month the deer have chewed this down to almost nothing, lots of pics with 3 to 4 deer eating at the same time, have ordered 2 more. Rated 5 out of 5 by Karen from First block ever I have to admit that I use this block to keep the deer on my property so they aren't hunted. Sorry everyone. I prefer to shoot them with my camera. But it is the first block out of five that they love. Rated 5 out of 5 by Mike 111 from Great price The deer really like these blocks, seems they can't get enough of these, the protein helps for a healthy herd and development of their racks. Great buy for this price. Rated 3 out of 5 by Doug from Good price...but does it attract deer? Have had Vita Rack block out behind my house for ten days by my deer corn feeder where I see deer most days. I have observed deer ignore it even when they are within inches if it. I have even seen deer sniff it and simply move on...this includes bucks, does and fawns. I will give it more time to perform but so far it's not looking good. Rated 5 out of 5 by Addison from good product. hope my 5 pet deer who live in our woods will like it. Rated 5 out of 5 by Buddy from Deer love it Best Deer Block I have used. Attracts them and they keep coming back untilentirely gone. The block stays firm and does not start breaking down like otherblocks I have used. I always keep a block out year round for extra nutrition. The price is also good.